Having my own tea lounge is an idea has been brewing for a year now. A year ago, I was seeing someone in SD, we hopped in a popular local cafe for late night desserts. Loose leave tea is offered by the cafe, there must be 20+ varieties, plus specialty coffee from famous coffee producing regions all over the world. To my taste, they are mediocre (both coffee and tea, even their desserts), but far more superior than most restaurants have to offer. 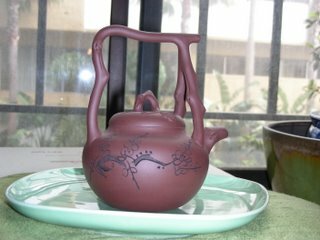 I was shamelessly bragging about my good tea and skill to my date, and he agreed. I jokingly said to him, I could have done better than this. Well, that idea got stuck to my head since, tickled my hidden fancy often enough that I decided to pursuit it. My family had been in the food industry since I was 15. We had 3 restaurants in a couple of large mid-west cities. Medium size dine in, fast food to a full scale 4000 sq ft full liquor licensed dine in restaurant. Yeah, I can make a few good drinks other than tea. ;) Growing up with such back ground has definitely planted an entrepreneurial root in every vein of mine. I truly believe the 3 key factors required for an event to take place and succeed in old Chinese wisdom: timing, location and harmony of human, 天 時, 地 利, 人 和. In my 20s, running a business was overwhelming, time and personal life must be sacrificed. Timing wasn't right and my heart was not harmonious with the business. I even had dreams that I was burned as sacrifice for some mysterious god like creatures, whom devoured my cooked physical being and my screaming spirit struggled to escape in a vaguely visible smoke form. I constantly reminded myself never to run another restaurant ever. Climbing the corporate ladder became the next trendy thing to catch on. I liked the uneventfulness of having a 9 to 5 job, as soon as I got out of work, worry free is a sensation I was not familiar with, but it felt good. I needed a break from running a business, and it turned out to be a long 7 years break. Living by other's bureaucracy for 7 years is as much as I can take. Ooooh, the 7 years itch! 3 weeks of vacation time is just not enough to satisfy my travel crave. It's one thing to change direction of your life/career, it's an other to change who you are, what you are born to do, and passionate about. My cooking/entertaining skill also took a back seat, the only time to whip them out are holidays, when friends and families get together. House parties up to 120 guests, with themes, seafood, BBQ and traditional Chinese food. Food has got the grease to bind friendships together smoothly. Friends are always curious why not open my own restaurants, there were even a couple of investors with serious offers. I like cooking to a degree that I am not stressed out about people yelling at me where are their orders. Cooking at leisure is what I love, but it's too labor intensive in a commercial environment. I shy away from any thoughts of having my own restaurant. In 2001, a year after I learned about kungfu tea, a family friend suggested I should have my own tea house since I am so intensely passionate about it. His father a tea veteran for 50-60 years offered to be my purchasing agent in China and Hongkong. Not having any thoughts of owning my own business at the time, due to lack of knowledge of the industry and tea itself, the tea house idea was way far back in my mind. My interest in tea gradually transcended from self-indulgence to a bigger picture over time, years to be exact. Working in a large health organization constantly expose me to the subject of preventative care, how to change the way we live for better health, in turn, of course save them money - lots of money on long term care. Health care industry learned that it's MUCH cheaper to spend money early on for scheduled check ups, nutrition advisory, educational seminars for 10's thousands members than spending millions on ONE transplant case. My objective is solely to avoid suffocation of pain and immobility inflicted by any illness. Looking young is not a bad bonus either. Tea becomes part of the solution of self-care health regiment. No one can take care of your own health better than yourself. You must have the will, you must have the drive to take care of yourself. It's not just the EGCG that gives you the health benefit, the practice of kungfu tea, the calming environment it provides, the tranquility it promotes are all parts of healthy living. Physical health comes from within - good mental health and clean colon track. Having over 20 years of chronic auto-immune deficiency syndrome, I learn that a peaceful mind is the key ingredient to healing, and tea is my salvation. The task to discover peace is daunting, and it only comes from your own experience no matter how many times you have heard how great it is for you from others. It's my mom's job to keep feeding me those messages, and I thank her for implanting them in my subconscious mind tirelessly. Maybe I am a bit of a rebel, I took the time and heartaches to learn this important life lesson. Most people would interpret peaceful mind as some one never gets upset, never show anger and such. Maybe it would be eventually, but my current stage of peaceful mind is to let out all the negative emotions in a non violent or destructive manner without interfering or hurting others when necessary, while building up tolerance and understanding of human mind which dictates our behavior. You must expel toxins in order to have a clean mind, repressing it internally will only snow ball an explosive break down in the future. Tea is an important and intricate part of my life. A change from the health angle, tea culture has drawn my interest deeper and deeper, without a specific goal, it was just an obsession for self indulgence at the beginning. In recent years, movies made in China featuring century old houses and furniture tweaked my interest of how refine and artistic my culture used to be, and will be again. The romanticism embedded with wisdom reflected in everyday living back in the old days is mesmerizing and eye opening. I was educated here in the states with very limited exposure to my own culture, I now want to seek out to learn more rather than waiting for it to become available in the US. I often imagine sipping tea in a wood carved open window second story pagoda like structure, right next to a meander canal, looking down at boats slip by, passersby on stone bridges, willow trees swaying in gentle breeze, cicadas singing in a sunny summer afternoon. 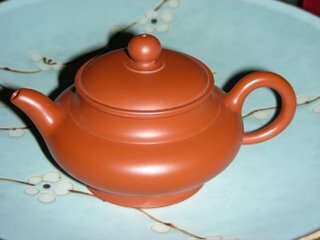 Or waking up in a beautify wood carved Chinese bed to a glorious morning, a gaiwan full of hot tea waiting on the table. What a beautiful way to live! Those fantasies were manifested into reality through traveling abroad. It sure struck up more fantasies. One of them is to live in Paris for half a year with my mother. 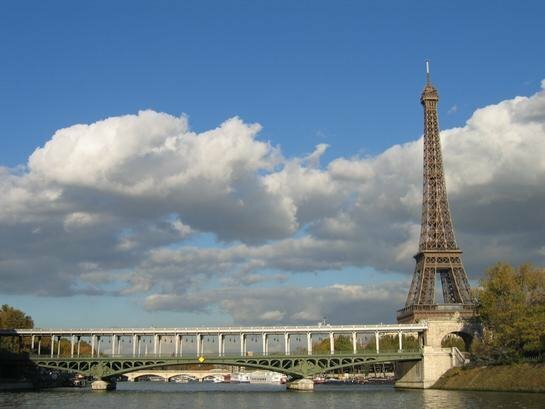 She loves Paris, it's modern, it's old school, it's artsy, it's easy to get around, all the modern features to enhance this richly aged ageless city. Ok this is not tea related, but I can drink tea in Paris other than wine. Wait, this sounds like pu-erh. Rich, aged, ageless! The more I dwell into, the more obsessed I become. There are misrepresentations of Chinese culture or Asian culture as a whole in the US, both among Asians and non Asians. My fantasy is to re-introduce to the masses the art and culture of China other than cheap consumer goods found in Walmart and 99 cents only stores. Nothing wrong with that though, it lubricates the economy wheel. 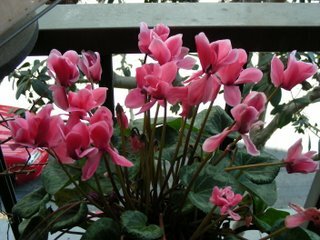 Disposable funding creates demand for quality and artistic life style, affords the artistic culture to grow and strive. It's not uncommon that Chinese-Americans express shame when the term "Made in China" is brought up. I was no exception for a period of time. Well, that shows how naive and lack of serious knowledge I was. Having these objectives in mind, the direction of my tea shop is inevitably be very "Chinese" with antique (some reproduction) theme. It's a start and will improve over time. It's all about the art of living and living to enjoy it! I don't claim to know everything about tea, although I made it my mission to generate interest in tea culture, it's up to the inquisitive minds to continue learning, it's also the motivation for me to continue learning as well. 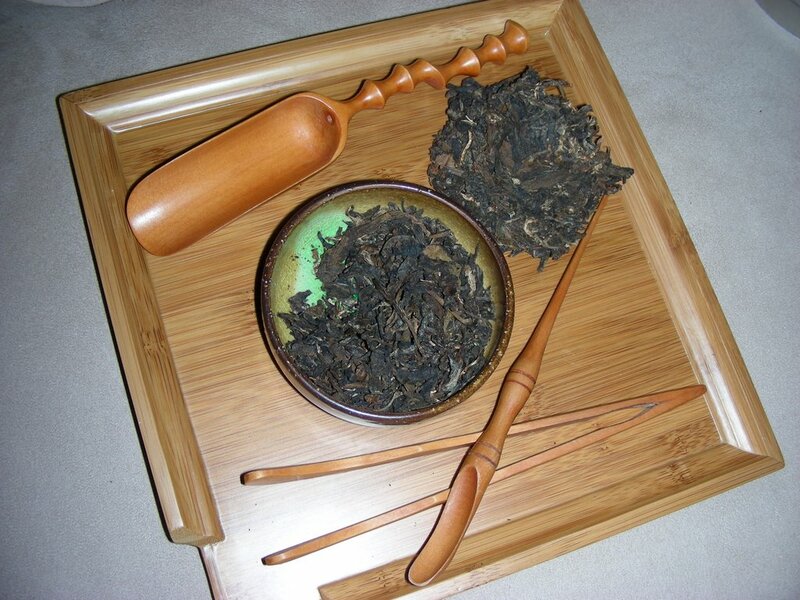 Pu-erh in the picture is 2001 Zhong Hua Yi Wu by Jing Ye Hao, a sample from Houde. It's on the thin side even I used more leaves than usual, about 5g. Color is light amber and clear, taste is smoked wood/veggie, not the actually smoke smell or taste, but like smoked duck but not cigarette smoke, if that was a good analogy. An indescribable flavor, perhaps a cooked prune in syrup taste? A little bit of sweet after taste, medium round mouth feel. It's a decent tea. I can't say I like it as much as others I had, but maybe it'll age better, and I think it has a good chance. My never ending obsession of obtaining teapots. 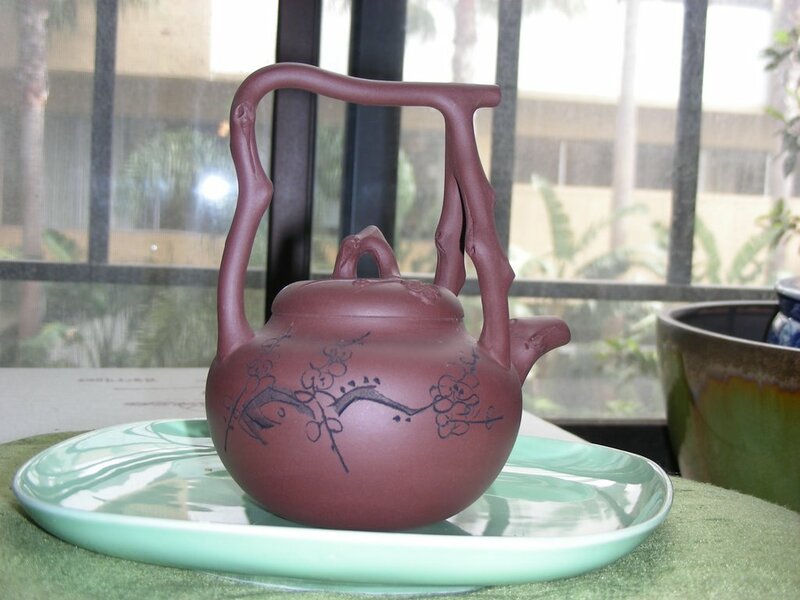 Pear shaped teapots are my favorites for now. A new member to the pear family, and the larger pot is up side down handle dinosaur egg. An intro of my tea drinking days. I have been reading pu-erh community for a good 6 months now, also posted a couple of times. I enjoy this pool of tea wisdom immensely. 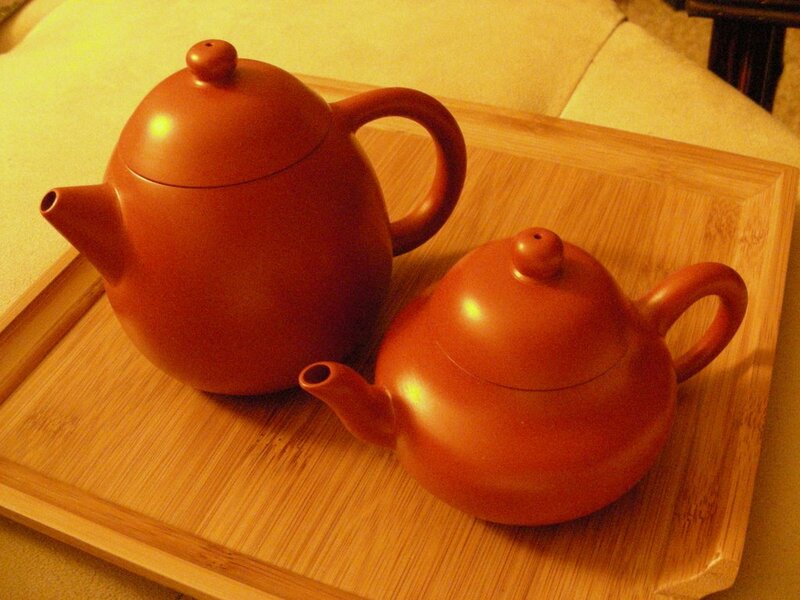 Only recently I discovered a link on pu-erh community of reader/user bios which I have not done. In a way, I am not quite comfortable shouting out my life in a big community as such. So without being "mysterious", here is my tea bio. 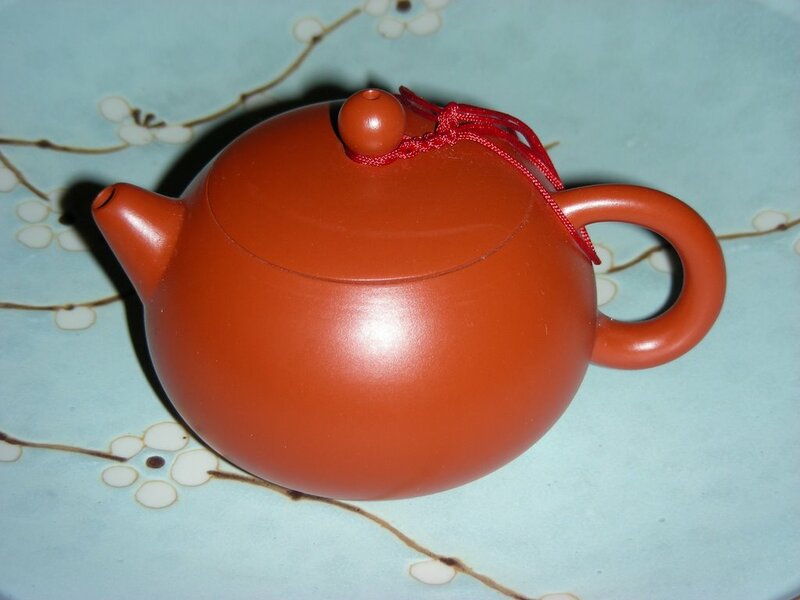 I started drinking tea ever since I could remember having visitors at just a few years old, mainly black and loose pu. It's a tradition to treat your visitors with tea. It's part of being Chinese which I feel extremely lucky to be to have such early exposure to the world of tea, although not the greatest tea at the time. After landed on land of the free, North America, for many years, I had lost in touch with my roots. Those days were about re-adjusting, trying to fit in in a new culture/country. Coke was cool although I could never get used to the sugary taste and the carbonation. Then it was the cocktail days in college. Gosh, the memory of alcohol after taste still urks me from time to time. Then it's coffee for a couple of years after college, cuz it's a social pad for people watching. However they were trendy/cool beverages I never find my passion sink in any of them, not quite satisfying either. 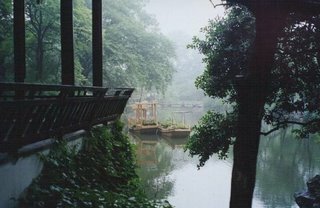 The turning point of discovering quality tea, rich history and art of China was 1998, my first trip to China since landed on North America. I had my first kungfu tea in Beijing. It was intriguing to observe how it was done meticulously, especially after knowing the term "kungfu tea" since as little as only a few years old. I came home with 20+ yixing teapots. 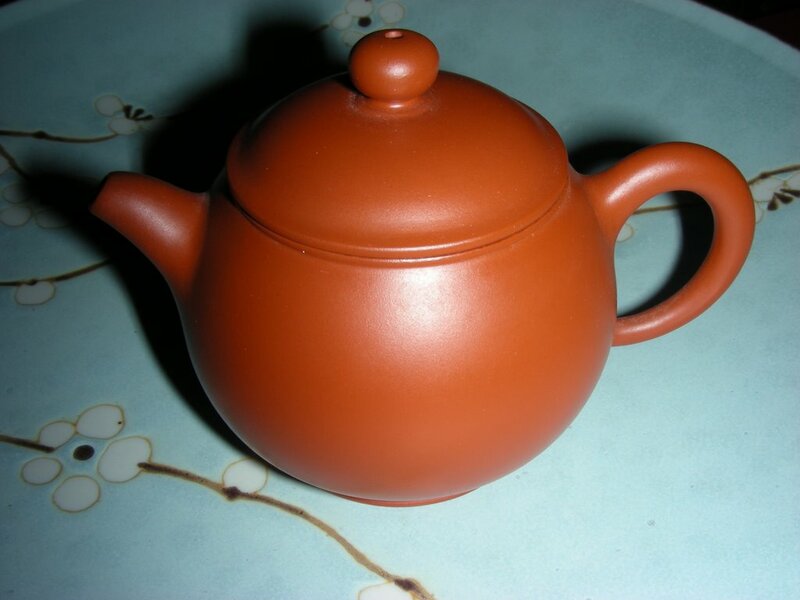 The airline made me checked in my teapot full carry-on, and broke a couple of pots and cups. Evil airliners! 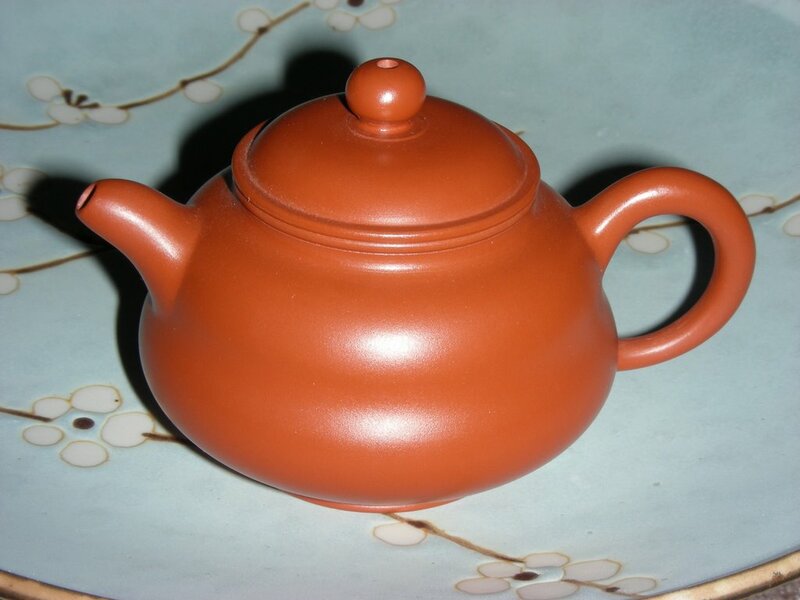 At the time, I was infatuated with the designs of the yixing pots, without knowing and learning about its usage and properties associated with tea. My friends were also contaminated by my new found teapot craze, I ended up giving most of them away, only a couple of them left in my hands as of today. I learned what quality tea taste like since. In 2000, I made LA my new home after living in various cities in the Midwest. A friend of my close girlfriend signed up for a 4 day tea seminar provided by Mr. Wang - owner of Ten Ren San Gabriel store, of course I tagged along for curiosity. It was a 3-4 hours session on 4 consecutive Saturday afternoons. The class was taught by Mr. Wang himself, a tea master, competition participant/winner at many Taiwanese tea events. He no longer gives free classes due to change of business direction in recent years. This seminar has further opened my sight. I have since drank tea the kung fu way only, oolong (family) is my primary choice, sheng pu has crept up on my list for a little over a year now. The experience has inspired me in many levels, not limited to just tea, it is a continuous walk down the path of 5000 years Chinese culture in all aspects. In addition to tea, I am also interested in alternative healthy living. Long term stress has caused me health problems that western medicine is not able to cure. Base on my own discoveries, I am inspired to introduce and share them with others in this fast pace society, where highly stressful working/living style is unavoidable. I am currently working on opening a tea lounge with a tea bar in Palos Verdes. 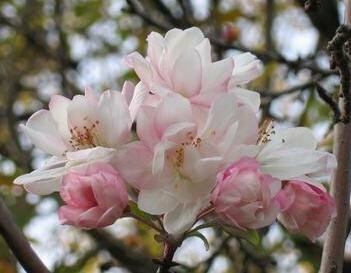 I will take on the mission of teaching/introducing the wonderful world of tea with what I know, share with and learn from the knowledgeable ones. I had the opportunity, and so should everyone else. My goal is to provide a relaxing space to rediscover ones center. Having good health both mentally and physically as the foundation of life is the only way to succeed in all areas, and have the luxury of live to enjoy the success. LA is my long term home, I hope to see tea culture flourish here, but not limited to here! I am trying extra hard to be creative tonight, but my brain is constipated! I am tired but sleepless, watching South Park mindlessly in the middle of the night, wondering what can I do?! hmm maybe take some pictures of my new pots. I haven't done that for a while, quite a few pots are waiting to be photographed. I had tasted so many tea lately, I can feel them oozing out of my eye balls. My pee must contain more EGCG than a bottle of Lipton white tea! My dad brought back a lot of tea from Guangzhou, he had also shipped another 70kg. I can have tea parties everyday for a year without running out of supply. Wish I could be more productive at composing tasting notes. Lately, my mind is refusing to function like I want it to. Everything I know about tea is drowned by stress. It's a rather common practice to add herbal medicines in rice wine in China, the remedies are long term nourishments which improve health and prolong life if drank daily over a period of time. Ginseng is one of the common kind, other odd remedies are lizard, rat, snake or tiger weenie, yeah..... you read that right, it was not a typo. I am making a ginseng sake here. Since sake is a low alcohol content rice wine, it's suitable for my taste. The ginseng I am using is a small inexpensive red ginseng root, they are widely available at most herb store in China towns across the states. Loosen the ginseng bundle, rinse with water and let air dry, then simply put them in the wine. I used 3 bundles in a 1800 ml bottle, 4 should be fine too. This ginseng sake is ready to drink in about a week. A shot glass (1 - 2 oz) of sake at dinner keeps the doctors away! 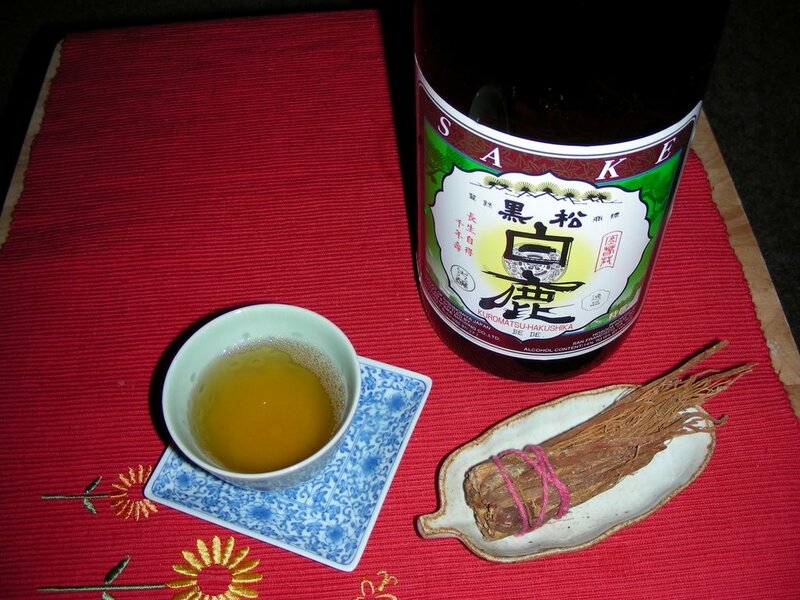 The taste is great, the sweetness in ginseng significantly mellows down the sharp alcohol taste. Drinking it warm is even better, the aroma of rice and ginseng blend well together which add dimension to the enjoyment.